Horseback riding provides excellent exercise to both you and your horse. Many horses benefit from regular riding, but it’s important to keep your horse’s physical well being in mind each time you mount up. These tips can help you keep your horse healthy and in shape through riding. Injuries are bound to occur if you push your horse into high-intensity activity too quickly. Simply spending the time to give your horse a good warm-up before moving into more demanding movements can help to keep him healthy. The same can be said about cooling down your horse – a longer cool-down gives your horse’s heart and respiration rates time to return to normal, and makes the recovery easier for his muscles. One of the best ways that you can keep your horse safe during each ride is to listen to him. Your horse’s body is capable of giving you an incredible number of cues about how he is feeling and whether anything is bothering him. Remain receptive to what your horse’s body is telling you. 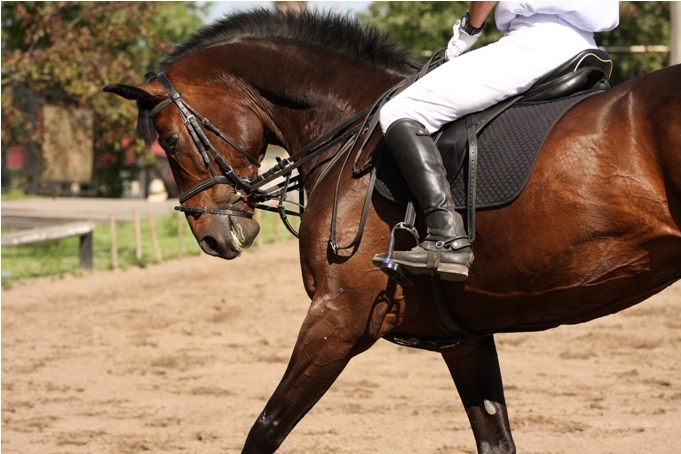 If you feel that your horse is tight and isn’t striding out as he normally does, then you will need to extend your warmup to see if he loosens up with time. Pushing a tight horse to perform more advanced movements can result in injury and potentially an equine mental meltdown. If you’re riding in a ring or arena, be sure that you spend an even amount of time riding in each direction at each gait. Your horse experiences stress on his muscles differently depending on which direction he’s going. Be sure to reverse directions frequently in order to help keep your horse comfortable and his muscles balanced on both sides of his body. Injuries can occur whenever a horse is pushed beyond his current level of fitness, so be sure to design your rides to what your horse is athletically capable of. Proper and gradual conditioning is important in keeping your horse comfortable and fit. Remember that you should treat your horse like an athlete, so gradually work him up in fitness and give him some recovery time and lighter work days in between your intense riding sessions. While it’s great fun to school your horse in tempi (aka lead) changes or over high fences, these upper-level movements are demanding and stressful on your horse’s body. It’s always a good idea to work on the basics to teach the foundations of the upper-level movements. Having a good foundation on your horse lessens the amount of time that you need to spend drilling athletically demanding movements, which can keep your horse healthier and sound. Every horse needs exercise, and regular riding sessions are a great way to keep your horse fit and healthy.